If you’re mailing orders out to your customers, you’re gonna want to charge shipping on your products. There isn’t a way to automatically calculate shipping, so you’ll need to set these costs up manually. Here’s how! Select the country you want to set costs for here - your home country is the best place to start. After that, you can pick which countries you’ll ship to and enter costs for ‘em. Want to ship everywhere? After adding your home country, choose Everywhere else from the menu and add your costs. That’s it! This is the cost customers pay if they only order that one item. If there’s more than one item in the order, the highest “shipped alone” cost in the order is applied, then the With others prices will be added. This is the add-on cost for each additional item in an order. In general, you may want to make this cost lower so you don’t overcharge customers. 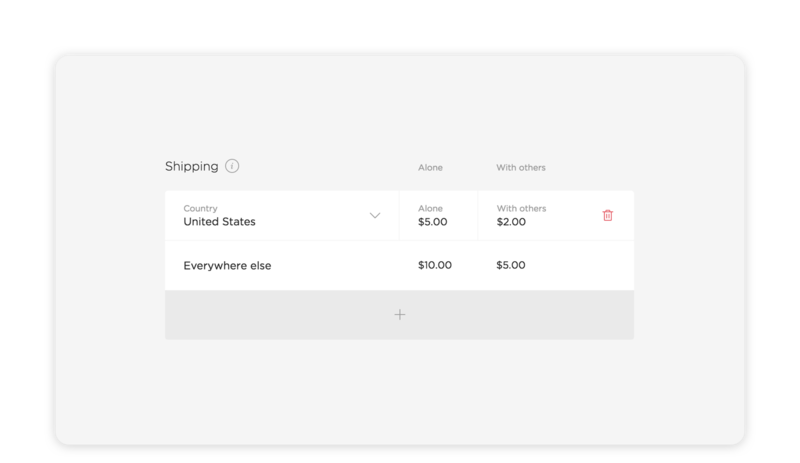 You can even set it to $0 for flat-rate shipping, so only the initial “shipped alone” cost will be charged for an order, no matter how many add-on items they purchase. For example: You sell a print for $6 shipped alone and $3 with others, and a tee for $5 shipped alone and $2 with others. Someone orders one print and two tees, so they’d be charged $6 + $2 + $2 for a total of $10 shipping. 💸 Not sure how much to charge? Measure and weigh the types of packages you plan to send out and plug those details in to your shipping carrier’s estimate calculator. It may take some adjusting to get right at first, but you can always come back to edit anytime! 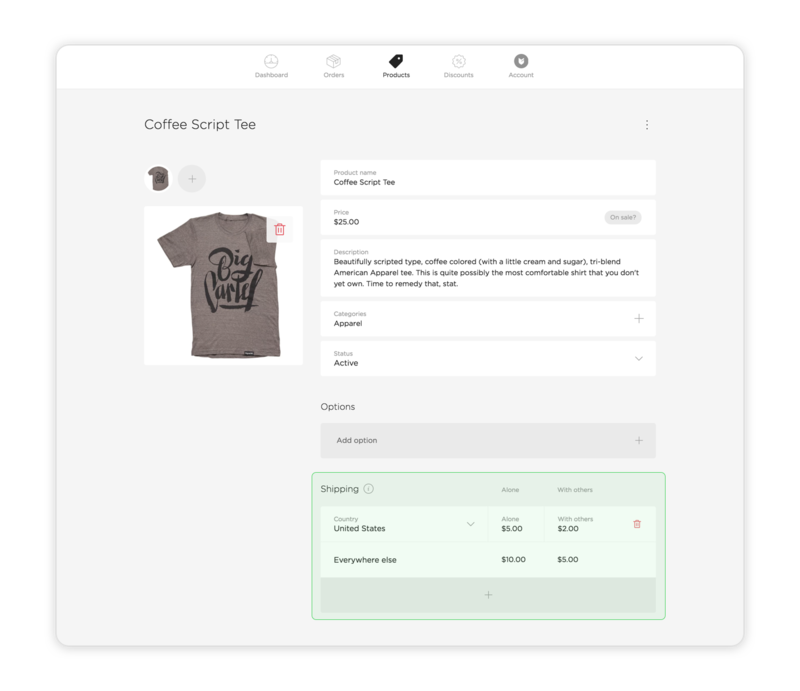 If you’re creating new product listings and don’t want to enter the same shipping costs over and over by hand, you can use the copy product feature in any listing to quickly add a new product with the same settings. Got changes to make to a bunch of existing products at once? Use the bulk edits action menu to select products you want to update shipping costs for, and make those adjustments in just a few clicks. Add a new product or click an existing one to edit it. Set a Shipping alone and With others cost. Repeat for as many countries as needed and click Save. Add a new product or edit an existing one. Set a Shipped alone and With others cost. Repeat for as many countries as needed and tap Save.